Our Holiday Challenge is commencing this November! Give the gift of health to yourself this holiday season and complete 19 classes before 2019 ends. Mingle and jingle together any of our group classes (Pilates, Barre, Yoga, Aerial) from 24 November to 24 December 2018. 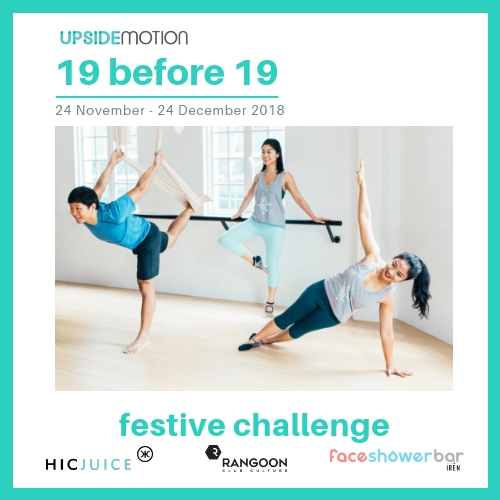 The challenge is open to all Upside Motion packages and ClassPass holders and you can attend as many classes in a day as you can. Presents await those who complete the challenge but the nicest ones will go to those who complete it the fastest! Sign yourself up today here! It's not too late to achieve your fitness goals or get a health upgrade this year. Let's celebrate the holidays and end the year fit and fabulous together at the Upside!